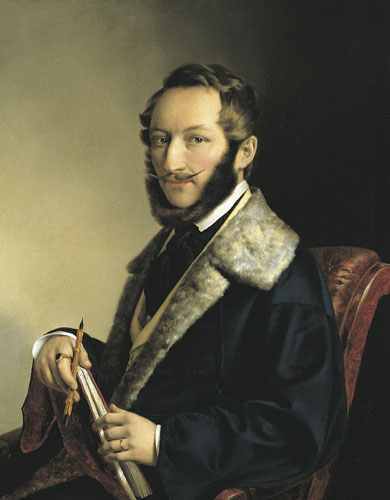 The 1830s saw the gradual development of the modern public sphere and its institutions in Hungary – to a large part due to the efforts of Count István Széchenyi, an important personality of the age already mentioned in my previous post. One of the new public spaces that came into being on the initiative of Széchenyi was the National Casino, a meeting place for intellectuals. Settling in the city of Buda in 1835, Barabás immediately understood the significance of such venues, and had himself introduced at the Casino – a move that helped him become acquainted with many future clients; many of them well-respected people whose patronage secured his reputation. His simple, but well-observed and elegantly composed portraits became popular with the Pest-Buda public, and he painted the likenesses of many famous writers, politicians and other intellectuals – portraits that have remained iconic to this day. Furthermore, he used the fairly new medium of lithography to disseminate his work, and was a prominent participant – and organiser – of the annual art exhibitions staged by the Pest Art Society from 1840, where he showed large-scale genre paintings, in addition to his portraits. Barabás would certainly merit a post that explored more aspects of his work, and I plan to write one in the future. Now, however, I would like to focus on one single event of his long life: his journey to England in 1843. Looking back on his youth near the end of his life, Barabás wrote his autobiography, which was published after his death, in the 20th century. He devoted several pages to his time in London – it must have made a lasting impression on him, considering he only wrote one paragraph about Paris and a few sentences about Genève, two cities he had also visited on the same trip. It is worthwhile to quote longer sections of this text (in my own humble translations). * I will not comment it extensively – after all, the text is already a comment on British cultural life, and provides a new perspective all by itself. Barabás arrived in London by steamship on 9 June, and was picked up by his friend John Cunliffe Pickersgill, a banker who helped Barabás sell prints made after his paintings in England and was a relative of the painter Henry Pickersgill. The Hungarian painter spent six weeks in London, enjoying the hospitality of Pickersgill’s parents and discovering the London art scene. ‘One of Pickersgill’s friends offered to take me to a private gallery. I had heard that the English were no great connoisseurs but still tended to amass large collections of artworks, spending large amounts of money on them. After the gentleman had told me that we were going to see the collection of a certain Mr Hope, I had no great expectations. If it had at least been a lord, I would have been more enthusiastic. The next day the gentleman took me to Mr Hope’s house and knocked on the huge gate with the knocker. I examined the building which had tall windows but an otherwise very simple facade: mere red bricks without any ornament. I was quite certain I was wasting my time. Barabás expressed his most sincere thanks to the gentleman who had taken him there, especially since he knew that English private collections were not easy to access. Still, he was not convinced. His accounts of his visits to public exhibitions show that he had his reservations regarding British taste. ‘At one exhibition, I saw a gentleman and his wife strolling around, secretly observing which paintings the other visitors were examining for a longer time. These were the pictures they subsequently looked at; the others were nonexistant to them. Maybe they feared that if they stopped in front of a bad painting, their connoisseurship would come under doubt. Laughing to myself, I felt sorry for them and their intellectual infancy. Having related that, I will relate the subsequent events too. When I told the story to the Pickersgills during lunch, the whole family stared at me. “Oh, oh, oh, oh! He is a most celebrated artist!” I was amazed. I told my friend Leitch about all this, and asked him to explain it to me. For, if Turner’s painting is beautiful, I obviously cannot understand English taste. Leitch told me that Turner used to paint very beautifully 25–30 years before, but his mental state had deteriorated to such an extent that he had become childish. The pictures he had painted in the last 25 years were not worth looking at, and even his best friends were not taking them seriously. But his reputation used to be great, and his fortune amounted to 600,000 pounds. There were many people who, being ignorant about the arts, were only after big names – and were thus ready to buy his daubs. Leitch’s explanation helped me understand the situation. A few days later I met Mr Croker, the brother of the head engineer of the Budapest Chain Bridge. I told him about my adventure, and that Leitch had explained everything to me. Croker smiled. I asked him why. “Let me tell you a true story about Turner,” – he said. “A rich lord wanted to buy a painting by Turner and visited him in his London studio. He saw one of his paintings on the easel, already framed, and asked him if it was for sale. Yes, it is, replied the artist. How much does it cost? 800 pounds. The lord paid the price and asked Turner to send the painting to his country estate, giving him the address of the steward of his mansion. Having received the painting, the steward wanted to hang it on the wall, but turning it this way and that he still had no idea which side was the top and which the bottom. Finally, he wrote a letter to Turner asking him for instructions. On the next pages, Barabás writes about the exhibition of the cartoons for the planned decoration of the Palace of Westminster. This competition probably fascinated him because he saw parallels with his homeland: the wish to establish Hungarian history painting and to find ways to patronise it was widely discussed in Hungarian art criticism at the time. I will not translate that part of the text now; the section about Turner already gives us enough to ponder. Today, it is easy to see Barabás as a conservative who did not understand Turner’s innovative art – after all, his comments and anecdotes are eerily reminiscent of the ridicule aimed at abstract art in the 20th century. It is also easy – although not very nice – to see him as a clueless tourist from a backward East-European country who was unable to grasp the intricacies of British culture. But what I like about this text is exactly the way in which it problematises both of these approaches. The Hungarian painter was not an ignorant alien in a strange culture: he was confidently adding his own two cents to a discourse that was still going on in England at the time, and – as the examples of Leitch and Croker show – he was not alone with his opinion. 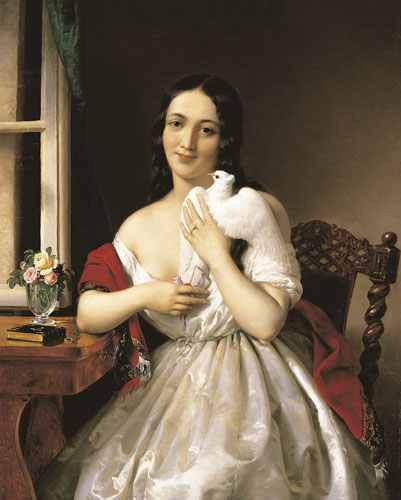 It is of course true that Barabás was looking at Turner’s pictures through the eyes of someone trained in the tradition of the Austrian Biedermeier – his meticulous and porcelain smooth way of painting could not have been further from Turner’s. On the other hand, however, he was well acquainted with at least one branch of British landscape painting. 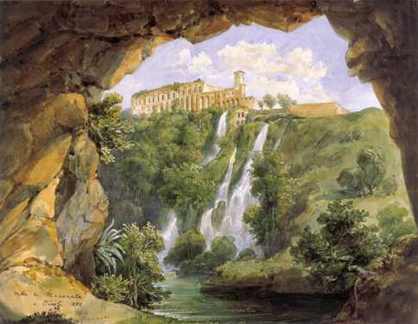 He had met and befriended the Scottish watercolourist William Leighton Leitch – the Leitch mentioned in the text – while he was travelling around Italy in 1834. He explains the significance of that meeting in detail in his autobiography. Before seeing Leitch’s work, Barabás had used watercolours in the same way as oils, aiming for a solid, detailed representation of the subject. After becoming acquainted with the British manner of watercolour painting, he started to use broader brushstrokes and concentrated on the view in its wholeness, instead of the details. 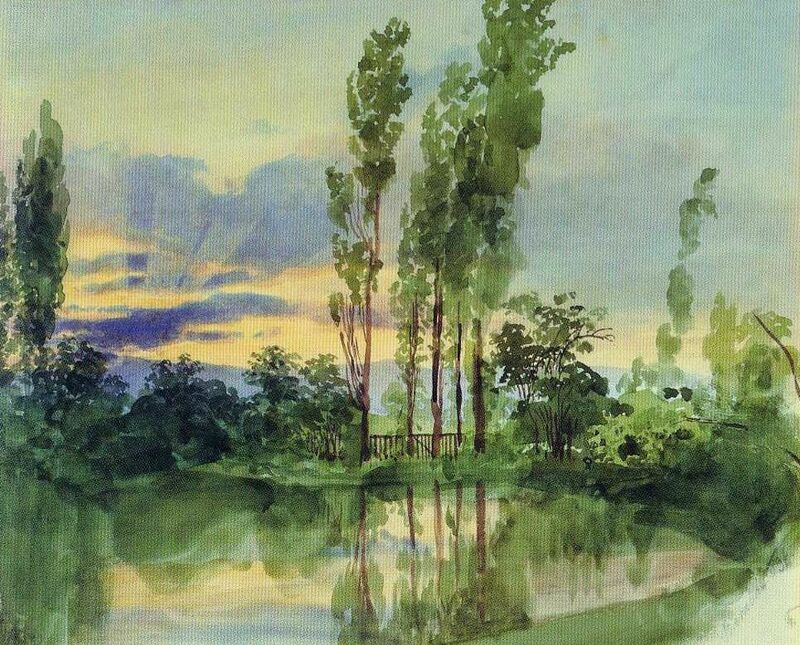 He became an excellent watercolourist, and the little landscapes he painted in Italy, and later in Hungary, constitute a significant part of his oeuvre. They are fresh, free, and impressionistic. Well versed in this characteristically British tradition, Barabás did not see himself as a complete outsider when it came to judging Turner’s paintings. From our 21st-century perspective, we could say he was wrong – but that does not make him less of a participant in the debate. At the same time, of course, he was an outsider in British society, and while relating his own impressions of London in his autobiography, he was also reiterating stereotypes. As mentioned in my previous post, it is not just the East that can be stereotyped by Westerners – it is possible the other way round too. What can we make of Barabás’ insistence on characterising the British as snobs even after his prejudices are magnificently destroyed during the visit to Mr (and not Lord!) Hope’s gallery? Why does the text depict British art lovers as followers of fashionable opinions, unable to make up their minds on their own? Even Barabás’ kind hosts, the Pickersgills, can only counter his opinion by citing Turner’s reputation – and not by explaining why his paintings should be appreciated. Furthermore, are these little scenes – the confrontation with the two gentlemen at the exhibition, as well as the conversation with the Pickersgills – not caricaturistic depictions of British ‘politeness’ – itself a popular stereotype? Is this text then a comical example of a cross-cultural misunderstanding, where each party is looking at the other through glasses tinted with stereotypes? To the English, the Hungarian painter appears as an all-too-straightforward buffoon, who boorishly interrupts other people’s polite conversation at an exhibition, while the Hungarian painter regards the British art lovers as overly refined snobs, who – their manners being too delicate to allow them to engage in an argument with a stranger – can only retort with an empty commonplace. This is a possible reading, but I am not sure it would do the text justice. I think the seemingly empty commonplace uttered by the gentleman at the exhibition provides a key to the text. Opinions can be so different. All of the characters in Barabás’ account are stating their own different opinions – but the very fact that they are exchanging them means that somewhere, deep down, they are standing on common ground. That common ground is provided, first of all, by their shared knowledge of Western art history – a canon of artworks to which they are implicitly comparing Turner’s paintings, whether favourably or not. Secondly, it is provided by their shared understanding of the modern art world; the modern concept of artistic fame. And thirdly, and maybe most important of all, it is provided by their acceptance of the fact that opinions may differ. They would be able to discuss Turner’s painting in detail if they wanted to, trying (and maybe failing) to convince one another. Instead of focusing on Barabás’ misunderstanding of Turner, it is also possible to focus on his clear understanding of himself as a European intellectual; one who is open to communicating with the world. * I am using the following edition (making use of its notes too): Barabás Miklós Önéletrajza, edited and annotated by Zoltán Banner, Kolozsvár-Napoca: Dacia Könyvkiadó, 1985, pp. 132-138. This entry was posted in Art history, Hungarian art, International context, Nineteenth century and tagged British art, Eastern Europe, J. M. W. Turner, Landscape painting, Miklós Barabás, Portrait painting, Stereotypes, Watercolour by Nora Veszpremi. Bookmark the permalink. He was quite a handsome fellow wasn’t he? Really love the “Sunset in the Plains”. Oh, yes, he was. 🙂 Thanks for reading! I like your point that Miklos Barabas engages in cultural exchange through both language and paint. I saw recently his portrait of ‘Archduke Joseph, Palatine of Hungary’ (1846) and was struck by the contrast between the intricate detail and rich textures of the figure in the foreground and the hazy backdrop of Pest and the river Danube. The sky recalls Turner in its evocation of light and atmospheric effects…I’m thinking of his ‘Rain, Steam and Speed’ (1844) for example. Perhaps, both pictures invite the viewer to anticipate an engineering wonder; Barabas celebrated the construction of the Chain Bridge in another vast canvas, and both artists seem to refer to landscapes of Venice . So maybe we have a dialogue which leads in lots of directions? Thank you for offering another fascinating line of enquiry into what we see in the galleries. Thank you for your comment! You make some great points. I think this is really the most important thing: Barabás and Turner may have been very different artistic personalities, who painted in very different ways, but at the same time, they were reacting to the same cultural changes. (Which, of course, manifested themselves in different ways in England and in Hungary, but if we look at European culture as a whole, instead of the countries in isolation, the connections are there.) And that is always a good starting point for a dialogue – even if opinions differ. Turner attended Pickersgill’s soirees in Soho Square. The portrait of his cousin Henry Harpur at Chelsea & Westminster Hospital has been attributed to Pickersgill. Thank you very much for your comment! This is very interesting, and sheds more light on the circles in which Barabás moved while in London. Have you by any chance ever come across a connection between Turner and the Hungarian painter Charles (Károly) Brocky, who lived in London from 1838 to 1855? I am not clear how John Cunliffe Pickersgill was related to the artist H W Pickersgill? Charles Brocky was taken up by Turner’s friend and patron H.A.J.Munro of Novar. It is said he met Turner in Paris in 1837 who introduced him to Munro then, who invited him to London, where he stayed at Munro’s house in 1839. But I would be interested to have more details. The annotations to the 1985 edition of Barabás’ autobiography claim that J C Pickersgill was related to the painter, but they do not refer to any source. I don’t know whether it’s just an assumption or a fact. As for Brocky: I don’t think much is known about his connection to Turner. Norman Wilkinson, who published a biography of Brocky in 1870, states the same facts as you. Was that book your source too? Munro of Novar patronised Brocky for a longer time, and Brocky also worked for the art dealer Dominic Colnaghi. Yes, Wilkinson was my source. But I also have a copy of the 1957 work on Brocky by Edit Lajta, pp.12-15, and note 34 on p. 39. Unfortunately however I don’t read Hungarian! I will see if I can find out more about the Pickersgill family. I’ve found a Henry William Pickersgill born December 1782 baptised 23rd June 1808 at St Andrew’s Holborn son of Thomas and Mary Pickersgill. It appears that Thomas and Mary had another child this time a daughter Mary Ann born 1785 baptised on the same day and same place as Henry William b 1782. There also appears to be a Henry Thomas Pickersgill and his wife Mary living at White Lyon Street, Liverty of Norton Falgate, Middlesex in 1777. They had a son Thomas born at this address. Henry Thomas at this time has switched from C of E to a non-conformist calling. It would appear that Thomas and Henry Thomas Pickersgill were brothers baptised 1753 and 1755 respectively to Thomas and Amey Pinkersgill. Both boys were baptised at St Matthew’s Bethnal Green London. I do not have any additional documentation to support the information above, but it certainly appears there was a London based Pinkersgill family dating back well into the 18th century, which still does not appear to be related to the Pickersgill, Dale, Cunliffe and Ellis families which make up the well documented John Cunliffe Pickersgill (later Pickersgill-Cunliffe) family line. Of interest might be the exploits of East India Army officers James Pickersgill and R. H. Cunliffe who served and fought together in campaigns in Nepal and elsewhere in the early 1800s. They both pop up quite often in despatches from 1816 when both were Captains. Thank you very much for your interesting comments! I am sorry I took so long to reply. I read Edit Lajta’s book long ago, and I seem to remember there was some additional information, but I cannot look it up now because I’m not in Hungary at the moment. I will look into this when I get home, and I will also look at the Barabás autobiography to find out why the author of the commentary claims Barabás’ friend was related to the painter Pickersgill. It is possible he was only guessing based on the identical names, but maybe there is more to it. Thank you again for devoting time to this – it is marvellous that you have the Edit Lajta book! I will be interested to hear your conclusions. An excellent post. I have a similar example of disparaging Turner’s painting from Count Athanazy Raczynski (mid-nineteenth century). Could this taste be seen as “conservative” also in the political sense? 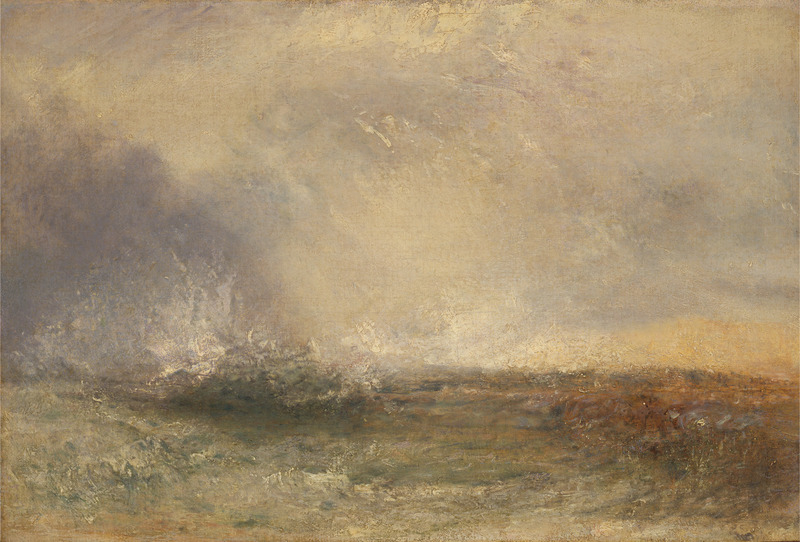 Turner’s pictorial techniques arose from a very different cultural and political environment. That’s an interesting question. I am always wary of making direct connections between political ideologies and artistic styles. But, on the other hand, of course it cannot be denied that the resistance to ‘modern’ artistic movements is often paired with political conservatism. As for Barabás, I think he could be called a moderate liberal. In the Hungary of the time he cannot be considered conservative, but he wasn’t particularly radical either, and did not really take part in the 1848 revolution. Where did Raczynski make his comment? Delightful post! Wonderful selection of paintings. I am not well versed in Hungarian art but was familiar with Barabás by name because my mother purchased a number of paintings in the late 1960s of rural Szekely life by his nephew Martón Barabás.